This clip autoplayed while I was working today and half-paying attention. I listened to the last part and thought, “This is excellent advice for people screening job candidates” and sent to a few friends who were hiring. Then I listened to it again and was reminded of advice I got from my father on the importance of asking the right questions to your problems to make sure you pull the right lessons. Can you ever reverse engineer solutions if you never examined what you got you there? Can you reframe challenges into opportunities if you fail to ask the right questions? It reminded me that problems and challenges can sharpen you and make you wiser but only if you choose. Wisdom is the gold medal awarded when you lean in to learn from your struggles. For women in tech, trusted Real Talk (not to be confused with #realtalk) is rare and usually done offline (the better to avoid Hacker News thread). Which is why I loved this post, How To Survive as a Female Founder. It has practical advice, manages to still be funny and touch on essential subjects of Real Talk– namely grinding (at work, at yourself) and looking up one day to see that all that effort is not getting you as far as your male peers. The game is rigged. So what do you do? “I’ve been struggling for years to make this work, and signs indicate that it is finally on the cusp of taking off. I not-ironically listened to this great Q&A Kanye West gave at the School of the Art Institute of Chicago. It was a session on the creative process, making art, his experience trying to study and navigate unwelcoming systems. I saw so many parallels between that space and the social change sector. Both worlds are art in their own right. Yet being able to thrive in either one and work with integrity to your vision while developing resources to ensure your work stays alive is a creative form all on it’s own. How we work is art. KW: Well, metaphorically, to be stereotyped as a hip-hop artist can be very much a hood that can put you in positions where people wouldn’t expect you to be. And in the same way how, when you step into places that have a “you’re not from here”-type vibe, if you are from there, and you’re too accredited, a lot of times people will put their guards up, and be less willing to work with you. And a lot of times I’ve been able to work with the most amazing people on the planet because I was considered not be a threat to what they do—because I was just there to be a “hip-hop artist.”… Actually, I use that little box and that stereotype to my advantage–to just be able to put that hoodie on and collaborate as much as possible. 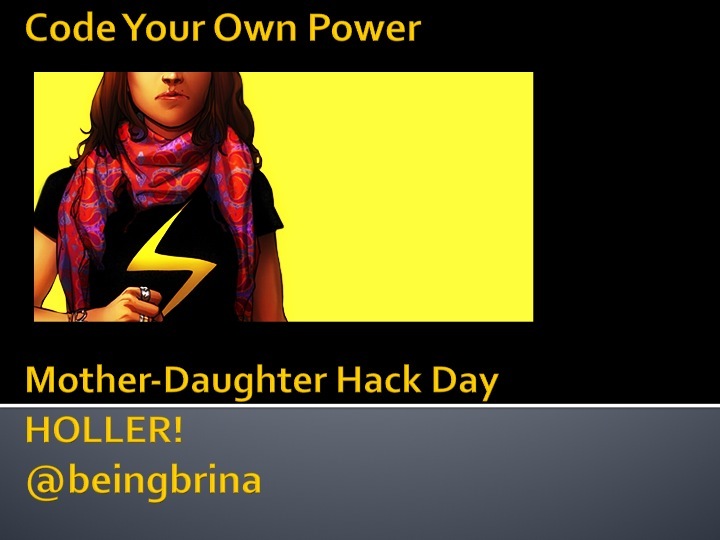 A few weeks ago I got invited to give a tech talk at a Mother-Daughter Hack Day from two dope local high school seniors who run a project called Inspiring Femgineers. I don’t have kids but had just given the graduation keynote at a local Girl’s in Technology program and had THE BEST time dismantling structural inequities via emoji and teaching them how to power pose. This group was a little younger (grades 5-8) but I said yes right away and asked if I could bring my 10 year old niece along with me. They said yes and we were game on. It only hit me yesterday that I didn’t really know what I was going to talk about. 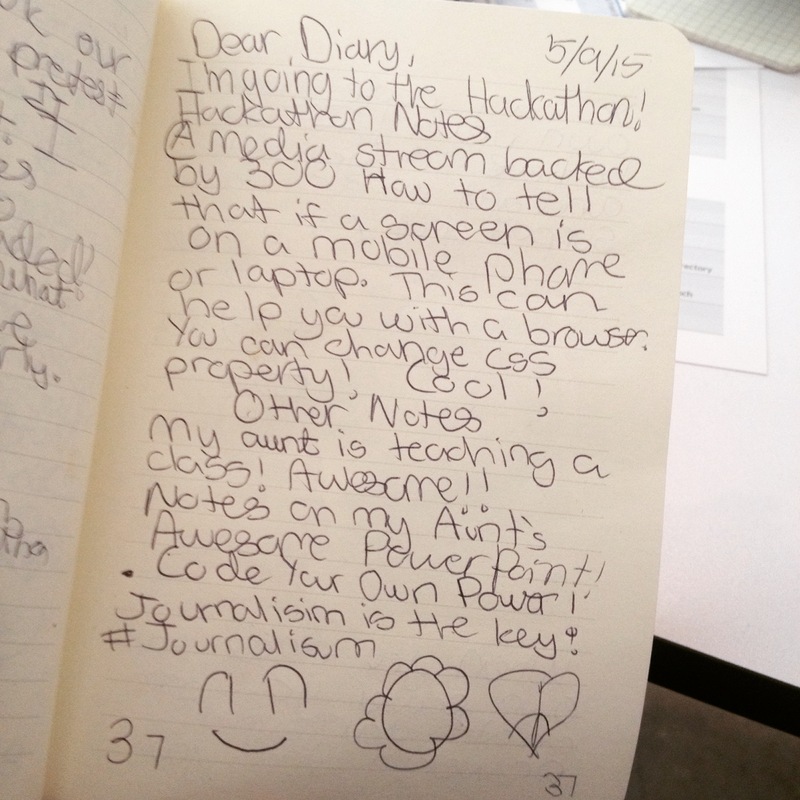 Like most hackathons, it was kinda ╮ (. ❛ ᴗ ❛.) ╭ go-with-the-flow. 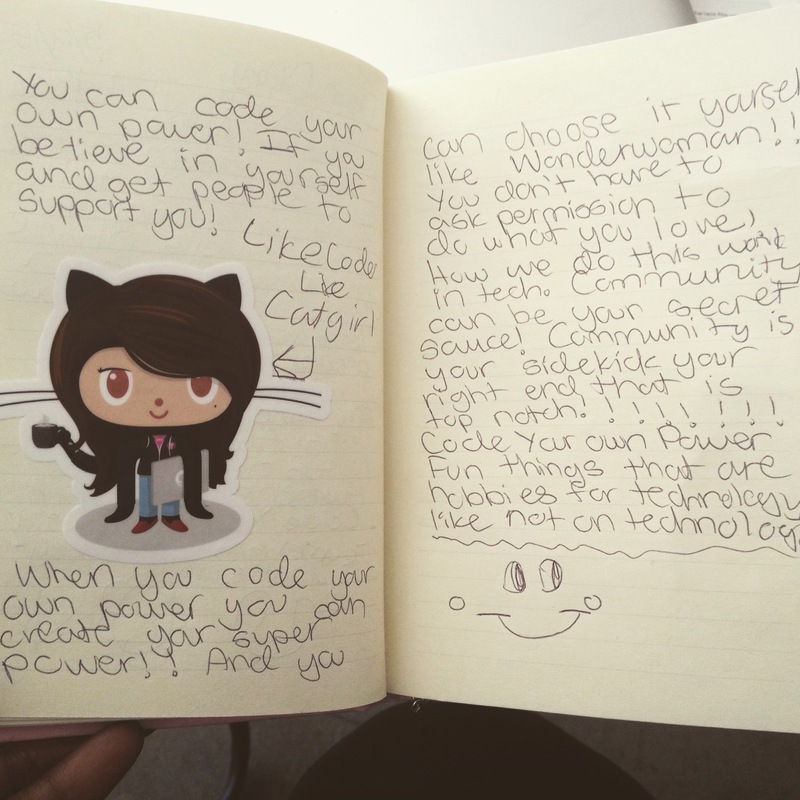 So I decided to remix an email pep talk I gave my girlfriends last year about building your own power into a lady-superhero themed tech talk. I talked about HOW to approach work in technology so it remains fun and you want to keep doing it. 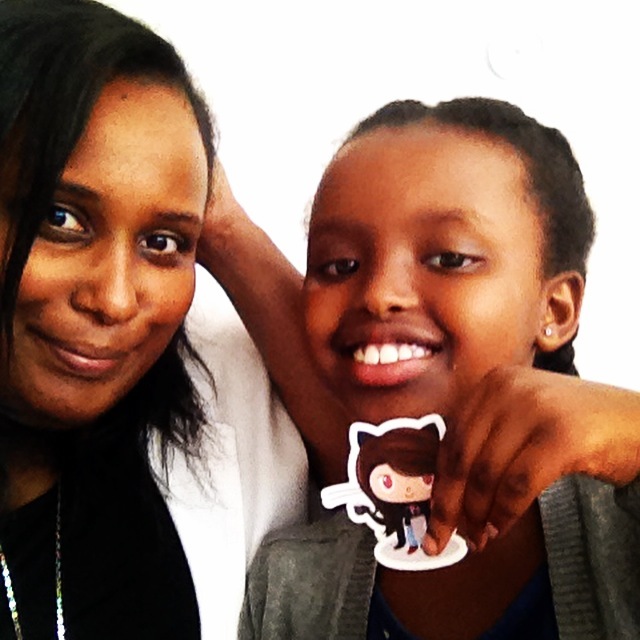 But mainly my message was this: learning to code is like building your very own superpower. You don’t need to ask for permission to create what you think should exist in the world and that’s awesome. When you’re doing awesome work, you will attract and build community full of people with their own awesome, funky superpowers (like back-end development! UX design! robotics!). Because eventually you’re going to experience resistance to your ideas and if you believe in your heart it should exist and you have an awesome, funky, superpower-packed community behind you, coding your own power is lot less lonely and a lot more fun. Oh, and my talk was entirely done in GIFs. But don’t take my word for it. My niece took the world’s most awesome/hilarious/OMG-we-are-totally-related notes. After the hackathon wrapped, my niece and I walked over to New America to visit DataKind whose phenomenal DC chapter were running a DataDive. DK’s team totally welcomed this junior data scientist into the fold and introduced her to all the projects teams were working on. Thank you DataKind, for your hospitality!!! All and all, a pretty sweet Saturday. “This is a place where all those things dovetail together so well,” she said. And to that I’m like YUP, yo. YUP. I want to keep it my special place so I won’t mention where but why I love it so much is a reflection of my love for community, my deep belief in civic tech and why I constantly beat the drum for inclusivity in how we talk about, fund and do this thing we call “civic innovation”. There’s no one in the pipeline! Women aren’t at the table! Where are the people of color?! 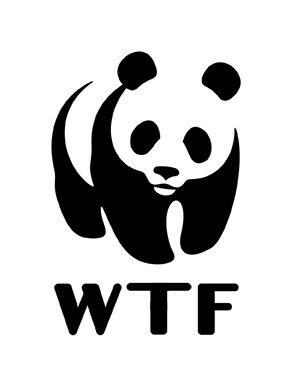 Waaah. As a woman technologist of color, I have conversations that evoke these phrases about 20x a week. The context for these exchanges are usually in conference rooms, small closed-door meetings or phone conversations where I am being asked to do things like explain the impact of structural racism and systemic barriers in less than 30 seconds or recruit women/people of color to do X or Y. It is as impractical in efficacy as it is exhausting. Also it is a special type of arrogance and erasure for technologists tasked to build tools that will re-imagine the citizenship experience to also not acknowledge or explore the opportunities and innovation in the very communities we seek to build tools for. And in failing to do so, as we build in this manner are we challenging inequality or are we unwittingly driving it? How do we build a future that not only creates new opportunities and power but also builds new forms of power that is distributed more equitably? Pipeline, table, these structures are artificial. No wonder no fun is happening there. When we, as community, create together, in community, we’re no longer doing civic innovation in a post-colonial context. This is how we need to build the future- in concert with one another. This is how we avoid simply creating a post-colonial Internet and take this opportunity in time to disrupt entrenched systemic barriers to access, engagement and joy. Communities can inform technology once we no longer ignore the world of innovation that has long existed beyond our conference rooms. Where do you go when you want to blend in yet still feel seen? Where do you go to escape but still imagine? Where can you unconsciously sway to the beat and realize everyone is doing a little dance of their own too? And what can we make when we meet there to build the future together? 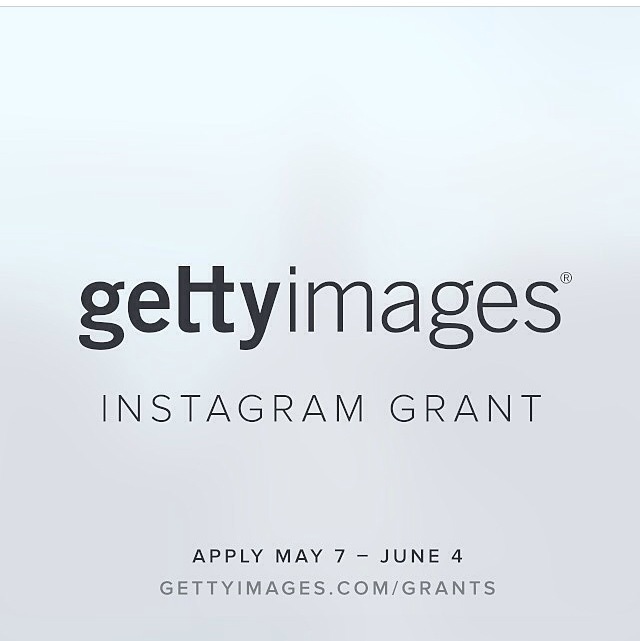 Today is the launch of the Getty Instagram Grant. The purpose of the grant is to support photographers using Instagram to document stories from underrepresented communities around the world. Three photographers will each be awarded $10,000 to continue projects of social impact on Instagram. When people you count on disappear and ghost from tough moments in life, it’s hard to take, difficult to process and it’s a pain that is completely avoidable. You don’t have words? Let’s help you find them. 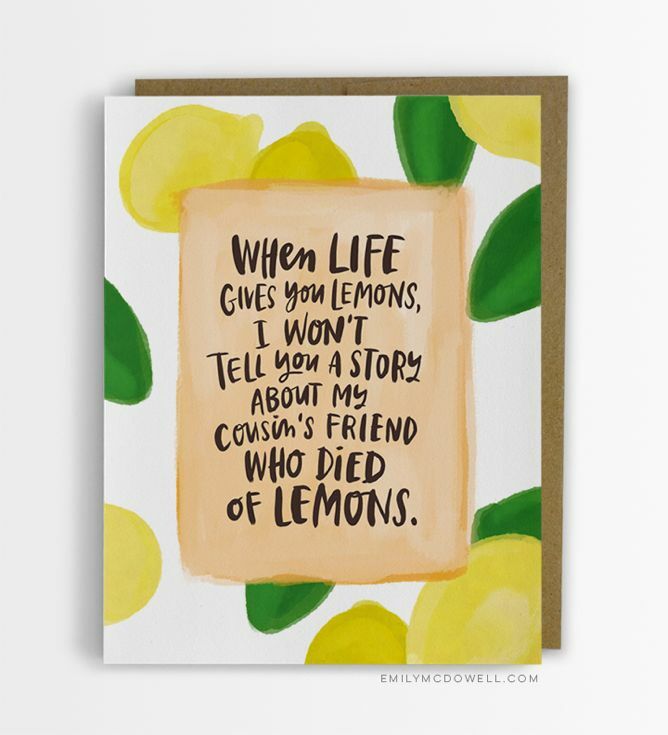 So this website for Empathy Cards created by brilliant cancer survivor is a INTERNET TREASURE. 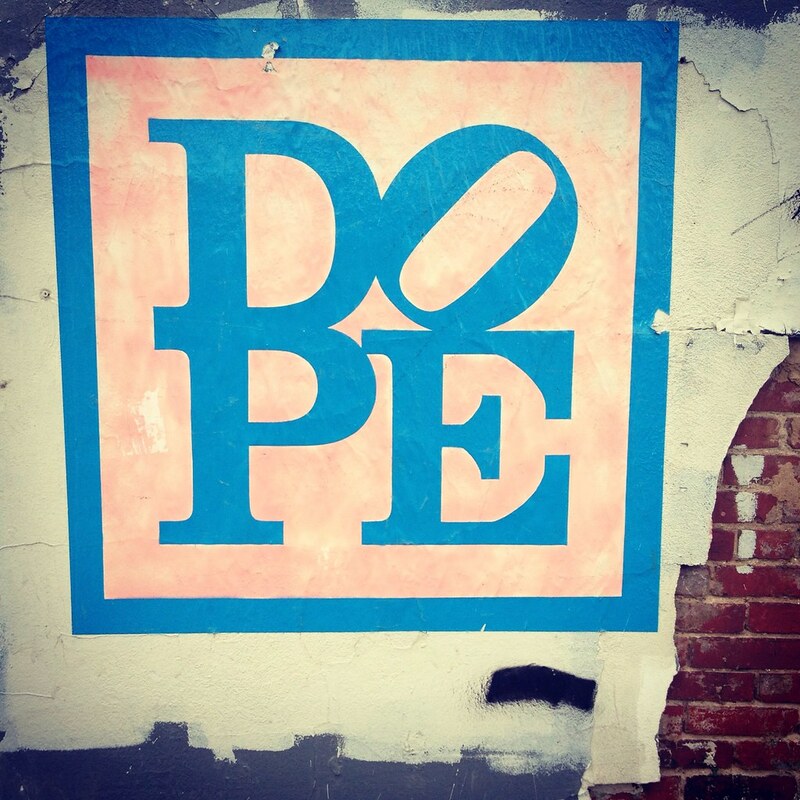 There is a severe empathy gap in our culture. We are not socialized to talk about death, grief or serious illness from a place of creating connection and support systems. 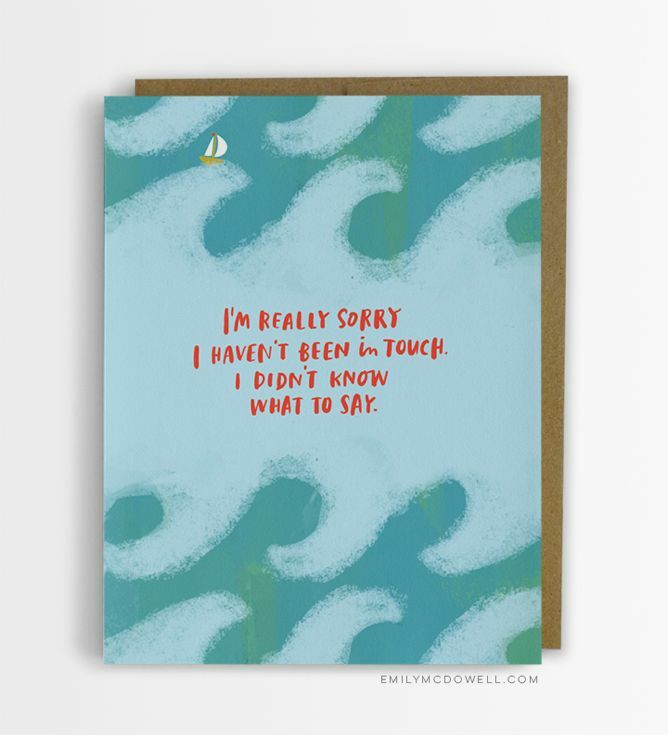 The pattern to approach pain and grief as something to be “fixed” rather human experiences to live and be supported through always struck me as deep culture disconnect. I’ve never understood people who “just don’t know what to say” and therefore disappear when loved ones experience grief, trauma and/or serious illnesses. Unfortunately, through death, trauma and caregiving for loved ones in my life, I have had plenty of practice to develop compassion for people who ghost but in my core I still think: Really? Really? This is Showing Up 101. How is this so hard? Last night in New York, I grabbed dinner with a friend who gave me the greatest gift just letting me talk through hard things with the grace of a someone who has survived her own rough moments through the power of connection, support and love. Connection, support and love. That is the heart of empathy. It is an honor to bear witness and love someone through their pain. Who will stand with you through yours? Quick post tonight, I am finishing a day running around NYC that ended at the Sidney Hillman Awards. It was the highlight of my day to watch so many friends I admire who grind in public service journalism be recognized. The biggest joy of all was watching Bryan Stevenson accept his award for his work leading the Equal Justice Initiative and Jelani Cobb be honored for his undisputed dopeness. My phone died before the night was over. After it ran out of battery, I sat in the auditorium in the New York Times Center, a digital nerd scribbling notes and quotes with pen and paper in the dark. I caught myself and thought, “I feel like I’m on the Oregon Trail…” closed my notebook and turned my full attention to the ceremony.